Session Premium Lager has done it again! The Session that started it all has won Gold at the 2018 North American Beer Awards, its 28th Gold medal overall. The North American Beer Awards, held in conjunction with the Mountain Brewers Beer Fest, is a unique event sanctioned by the North American Brewers Association. The competition provides an opportunity for commercially produced beers to be judged against the best beers in the country. The event is conducted as a single blind sampling followed by rank ordering of the entries within a category. The original Session is a classic, all-malt lager that’s crisp, smooth, and refreshing. 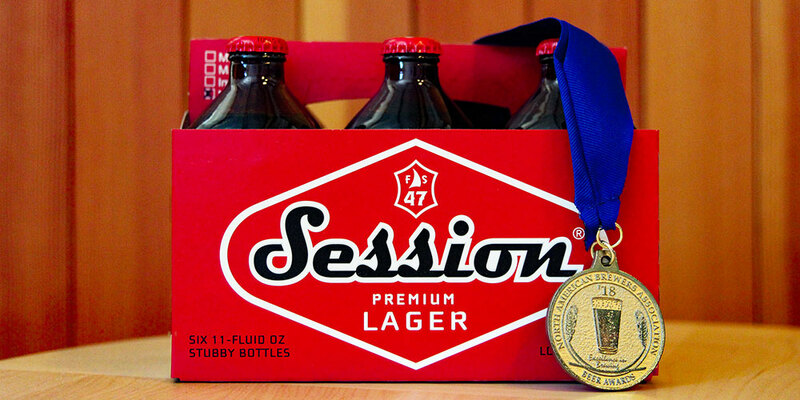 Winner of multiple gold medals at the top national and international competitions, Session Premium Lager is a beer that truly crosses boundaries, from blue collar to white, red state to blue, cocktail bar to bar-be-que. Session Premium lager is an extremely tasty import-style lager, like the kind of beer made back in the pre-Prohibition days— plenty of flavor that goes down clean and smooth, we like to call it ridiculously tasty. American and European hops offer a wonderful noble hop aroma, and the two-row barley malt and a touch of wheat malt give a pleasant, refreshing finish. Why have a beer when you could have a Session! Available in 11 oz. bottles in 6-packs and 12-packs, in 12 oz. cans in 6-packs and 15-packs, in single serve 19.2 oz. cans, in the Mashup variety pack and draft.